A super antioxidant, nourishing Olivane ™ Repair Serum with organic bio-active Green Tea extract & Kakadu plum for an antioxidant rich formulation infused with pure organic Neroli, Mandarin and Bergamot to balance, brighten, clear and stimulate cell renewal. Enhanced with the active benefits of organic aromatherapy pure essential oils, wildcrafted and indigenous botanicals. 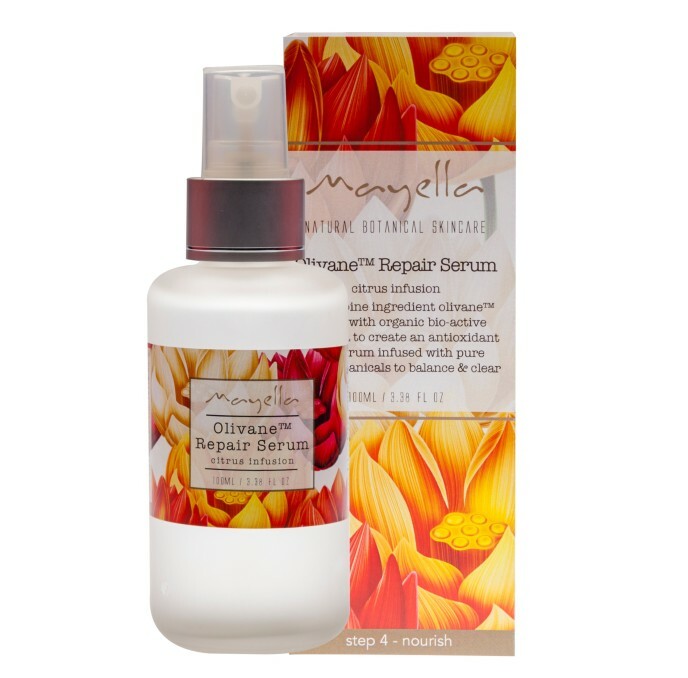 Mayella ® Olivane ™ Repair Serum – Citrus Infusion has been formulated for the purpose of creating an antioxidant rich, clarifying, vegan bio-oil for use as a daily nourishing serum that is suitable for all skin types and ages. Safe and sensational for Women, Men and Teens. Mayella ® Olivane ™ Repair Serum – Citrus Infusion is formulated specifically to support deep hydration, reducing pigmentation and inflammation to achieve a brighter, clearer complexion. Our bioactive serum absorbs to the deeper layers of the epidermis to nourish and protect young growing cells and is a significantly positive influence for skin with improved balanced moisture, elasticity and a youthful glow. The synergistic action of the botanical ingredients forming our nourishing Citrus Repair Serum, beautifully intensifies the calming, hydrating and supremely antioxidant properties you will feel immediately on application. Our Citrus Infusion of organic pure aromatherapy essential oils gently balance skin that is uneven in texture and tone. Pure Neroli, Mandarin and Bergamot brighten and tone skin that is prone to pigmentation, break out or uneven oil flow, often called a combination skin and work beautifully within the healing properties of Olivane ™ to encourage a more lively skin able to heal blemishes, scarring and oxidation damage. Highly recommended for a clearer complexion and hydrated glow. We call this heavenly serum the Bliss Out Infusion. What is Olivane ™? In healthy human skin, squalene is found abundantly. It is a matter of nature’s blessing that we are gifted this amazing super antioxidant from the very earliest expression of single celled life on our planet through to today, where squalene is found in the very membranes forming our cells, found in our epidermis, and involved as an essential partner in various bio synthesis pathways such as macro phage immune cell stimulation and healthy cholesterol formation. The squalene form is the super antioxidant power that also protects our skin from UV radiation. In fact it is the first target molecule of UV radiation, taking a full hit of UV rays damaging ionising potential which we as hairless mere mortals are particularly vulnerable to. Squalene is an isoprenoid, a super antioxidant and one of the most stable in the isoprenoid family and a powerful fighter/regulator against free radical damage, oxidation and preventing cellular destruction. Mayella ® Olivane ™ concentrates the protective benefits of squalene to healthy cellular lifeforce in its potent formulation process. A few drops daily, morning and evenings in a skin care routine, is a significantly positive influence for achieving radiant skin with improved balanced moisture, oil flow, elasticity and a youthful glow. Topical application of Mayella ® Olivane ™ Repair Serum – Infusions are divinely aromatic, quickly and effectively absorbed for optimal biosynthesis, becoming possible within a healthy epidermis having cellular integrity and immune responses. Importantly embracing Mayella ® Olivane ™ Repair Serums in a daily skin care routine contributes to creating these optimal functions for a lifetime of naturally healthy, radiant, glowing skin. Mayella ® Natural and Botanical Skinfoods and Make up are 100% pure, clean, vegan skin care. Made by us here in Australia for you with the ultimate in good health in mind. Gluten free, animal cruelty free, dairy free and no petrochemicals, harsh alcohols, parabens, palm oils, nano particles, GMO’s, needless fillers or inert bulking agents. Just concentrated bioactive skin foods as Mother Nature intended with a little help from alchemical science and us to get them to you, in your daily life. We source globally from the optimal geographic destinations, boutique producers and it is our privilege to work with growers of fairtrade and sustainable origins. 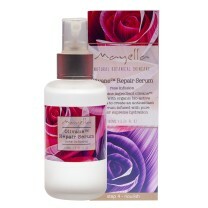 Your skin will show the difference with Mayella ®. Use morning or evenings with your daily skin care routine. Shake bottle well and disperse 1–2 sprays of Olivane ™ Repair Serum – Citrus Infusion onto clean dry hands. Press serum onto your whole face and neck, massaging in gently with an upward outward circular motion. Face and neck will be left feeling nourished and hydrated. Within our Mayella ® daily skin care Mantra, we advise a layering of our concentrated botanical skin care for the best and potent benefits. In the mornings and evenings, apply Olivane™ Repair Serums with personalised choice of Vitamin Serums or Lotions from Step 3 – Vitamise In the mornings apply with Step 3 – Vitamise & Step 5 – Protect. Contains certified organic bioactive botanicals and aromatherapy pure essential oils of the highest quality. All ingredients are sourced ethically and primarily from their indigenous origin, then formulated with love in Australia. Vegan formulations free of GMO and palm oil and are animal cruelty free. *Camellia sinensis (Green Tea Extract*) – Strong source of antioxidants, anti-inflammatory, antibacterial, stimulates blood flow, clears, decongests, energises and brightens skin appearance, repairs UV damage, calmative, high in catchins, regulates cell formation and inhibits cell mutation. * Citrus aurantium ssp amara (Pure Essential Oil of Neroli*) – clarifying, naturally antiseptic and calmative, self regulating to moisture and oil balance of epidermis thereby assisting in the maintenance of a healthy acid mantle and protection from oxidative stresses. **Terminalia ferdinandiana ( Kakadu Plum**) – acknowledged as the worlds highest source of Vitamin C. Kakadu Plum is an Australian native botanical renowned for its ability to nourish and protect the skin from ageing oxidative damage, promote collagen production in young and mature skins and able to assist in prevention of hyperpigmentation for clear, bright skin. All other ingredients are classified as natural minerals, vitamins or compounds. Only pure and natural organic essential oils bless our skin care with divine aromas. Mayella ® botanical skin care uses advanced technology with ancient knowledge to fuse together the superior relationship of Nature and Science in naturally preserved formulas without the need for toxic chemicals or synthetic fragrances.